The tiny Picori appeared from the heavens, bringing the hero of men a sword and a golden light. With wisdom and courage the hero drove out the darkness. Just once in every 100 years, a secret mystic door opens, and the Picori come to visit. The Picori were also said to bring happiness to all they met but would typically only be seen by good children. A century had gone by since the Picori were last seen and while many now believed them to be just a fairytale, the Festival was unusually grand. A Sword-Fighting Tournament that called to mind the heroes of legend was taking place at Hyrule Castle. The one coming out as champion was a man by the name of Vaati. He won the tournament with some ease, using dubious means that the brave men assembled there could not hope to match. And yet not a single person knew this shadowy figure, making the people wonder who Vaati could be and what he was really up to. Link agreed to go with Zelda as he was to deliver the prize for the champion, a sword finely crafted by his grandfather. While on the festival, Princess Zelda won a small shield and gave it to her friend Link as a present. Eventually they brought the sword to Minister Potho, just in time for the award ceremony. The minister told Link about the sword displayed on the award ceremony, the sacred Picori Blade, he said that the sword stuck into the Bound Chest sealed great evil within it, and that as a prize, the winner of the competition was allowed to touch the relic. Boldly, the champion Vaati approached the sword. As he stood before the sword he complimented himself, boasting that he would now retrieve the content of the chest. The castle guards tried to stand in his way but to no avail, Vaati let a sphere of dark magic fly into the sword, breaking it and opening the chest. There was an earthquake and countless monsters were released, knocking away all the presents except for Vaati, Link who defended himself with his shield and Princess Zelda that was protected by the power said to flow in the veins of every royal lady. They confronted Vaati, but with little effort the latter was able to knock out Link and turn the Princess into stone. Vaati went on to look into the chest, but there was no trace of the force he was after. Puzzled he left to continue his search. When Link came to, he was in Hyrule Castle. He went to see the King as the latter ordered his soldiers to search for Vaati, but that would do little good. If they still had the Picori Blade its power could be used to break the curse on Zelda, but then the king revealed a secret held by the royal family: not only the Picori did exist, some of them lived in this world, within the Minish Woods southeast of Hyrule. They would be able to reforge a new sacred sword. Unfortunately the soldiers could not take the shards of the Picori Blade to them, because the Picori would only show themselves to children. Link's grandfather then suggested to send the latter; the king warned him that this would be a dangerous journey now that monsters roamed Hyrule, but still pleaded for his daughter's life. So Link was given the broken Picori Blade as well as the sword his grandfather had crafted for the champion, in order to defend himself on the way to Deepwood Shrine where the Picori could be met in the past. Thus Link begun his quest, fighting the released monsters he made his way into the Minish Woods, there he ran into a strange cone of green cloth with a bird's head on its top that could speak. It was being harassed by monsters and cried for help. Link rescued the strange being and told him about his errand in the forest, the stranger said he too was trying to break a curse cast by Vaati and introduced himself as Ezlo, offering to accomapny Link on his journey. Ezlo had no legs so he resolved to behave like what he, ultimately, was: a cap. He took place on Link's head and the two went on to find the Picori. As they approached a tree stump Ezlo, who had quickly slipped into the role of mentor, told Link that to meet the Minish, the ones Link's people had dubbed Picori, he had to shrink himself down to size in order to enter their village. The stump was in truth one of the many portals scattered all over Hyrule that was once used by people to adjust their size (of course not all of them were carved into a tree). Ezlo knew the incantation to use it and Link shrank and started to explore the forest with this new perspective. Fortunately larger monsters ignored him. Soon he reached the Minish Village; many of the curious being came to greet him, but Link could not understand them. They wore green clothes, red hats as pointy as their ears and had feathers as tails; their homes were made out of everyday objects like vases and boots. Ezlo could not properly translate their tongue either because he was used to a different dialect of it and the two went to look for someone that could understand Link's language. Fortunately they found Festari, guardian to the Minish abbey and the shrine, he advised them to find a Jabber Nut, that would allow Link to understand their tongue and gave them directions. Link found and ate it, then went to talk with the other Minish. He learned that once everybody was able to see the Minish and that while their ancestors did come from another world, the Minish were in fact all over Hyrule even in the town he came from! Finally he was also told by the elder that to reforge the sword he'd have to seek Master Melari the Minish smith and his seven apprentices mining ore in the mountains. But the smith's skills alone would not suffice, they had also to collect four elements, crystalline embodiments of the energies that fill the world, and infuse them into the blade. He gave them directions to the elements, in particular the Earth Element, found just in the shrine to the north that was now infested by evil creatures. Despite the danger, Link ventured into Deepwood Shrine; with Ezlo's advice he navigated the dungeon within, and defeating the monsters he claimed the Earth Element, source of all life. The Minish were impressed with this achievement. But then then, they recognized, humans were amazing creatures. Minish thrived by making them happy, it gave the minute beings energy. But in these days they did this in secret, by hiding items into bushes or by creating items such as the Kinstones, small medals broken in two halves that would bring "good luck" when reunited. The Minish also cared for particular plants, Pico Blooms, the nectar of which was turned into Picolyte, a substance that made people incredibly lucky, and left by the Minish in town at night for people to find it in the morning. These were only a few of the things Minish did to make others happy. The elder plauded Link's courage and told him to head for Mount Crenel, to find Melari. The Minish also gave Link a bag of bombs, so he could clear the debris and return to town. They also run into a strange stone slab that read "Holder of the sacred power we grant you the power of the winds." and that crumbled leaving a mark on the ground; this would happen several times to the puzzled Link. Stopping by the town, Link went to brave Mt. Crenel and reached Melari's mine. The burly Minish accepted to fix the sacred blade, but advised Link to continue his quest for the elements while he did, as one was supposedly in the nearby mine dug by Link's people. Part of the mine was filled with lava and inhabited by monsters too. But Link made his way through (using Ezlo to float around with the hot air, among other things) and recovered the fire element that brings light and warmth into darkness. Link went back to Melari and found that he had completed what he dubbed the White Sword, which would become a sacred blade once infused with the power of the elements. To do so, Link had to enter the elemental sanctuary, a strange realm trapped between two worlds, Link's and that of the Minish. Its door really did open once every hundred years within Hyrule Castle and could only be seen by the honest eyes of a child. Equipped with the new sword, Link returned to town; now he able to meet the Minish that lived there too (many under roofs) and noticed that these too all had pointy hats, but of different colors. Then, without further ado, Link went on to the castle and there the glowing door was in its courtyard. Going in, Link found himself in the Elemental Sanctuary, a place that seemed to be made out of crystal and floating among the stars. There he found a pedestal between four pillars; he placed the sword into it infusing it with the power of the Earth and Fire Elements and this granted the White Sword the power to split him into two. With this new ability Link departed the castle again, but just outside, Vaati appeared before him. He spoke to Ezlo, mocking his former master's condition and the latter retorted that he should never have created the cap that fueled his insane desires. But Vaati just thanked Ezlo for allowing him to become a powerful sorcerer from the minuscule being he once was. Vaati then left, after summoning some monsters that Link quickly dispatched, and Ezlo resolved to tell Link about himself. We are the Tribe of the Winds. Long have we lived with the winds. We have mastered them. Now, we join them. Together, with the great winds at our backs, we head for the skies. Those who come seeking our power must play the notes Zeffa teaches. May they lead you onward to the power that you seek. And just then, a bird flew by dropping an instrument, the Ocarina of Wind. With it Link could summon the bird and be taken to any of the Wind Crests that the crumbling stone slabs had revealed to him, as well as another one that would lead him to his next destination. Before leaving, Ezlo said that these ruins were definitely where the Tribe of Winds lived, but it seemed as if they had left for the heavens, taking their Wind Element with them. Therefore the two decided for the time being to look for the other remaining one. Link used the Ocarina and the bird took him to Lake Hylia. There he found a Minish who told himthat to enter the Temple of Droplets he would have to seek the knowledge of an elder Minish who once got into it and now resided in the town library. 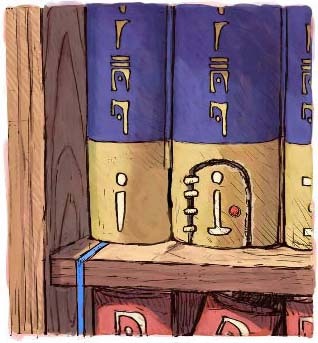 Link had to recover some of the books, from several persons (such as the idler town mayor who had a hobby of collecting masks) and in one found the elder's home. From him, Link obtained the flippers to get into the next shrine and managed to collect the Water Element, which nourishes life. As he left the temple, though, he was visited by an apparition: it was the ghost of Gustaf a previous King of Hyrule deceased ages ago. Recognizing Link as one who fought to save the land and its princess, he asked the boy to come stand before him; only then the path would open. The two decided to follow the King's indications to the Royal Valley, where past generations of the castle's inahbitants were buried, but only after sneaking in the castle and infusing the sword with the new element, gaining the power to split into three. When the blade has been infused with the four elements, the way to the light force shall open. 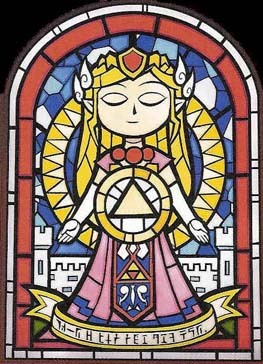 And the force of the golden light, embodied in Hyrule's princess, shone forth upon the lands. Suddenly malicious laughter was heard: Vaati had followed them into the chamber and thus learned the the light force he sought had been all the time within Princess Zelda. Ezlo urged Link to chase Vaati to the roof before it was too late to save Zelda; as they left the chamber and returned to the castle they found it transformed in a dark fortress, with people turned into stone at every corner and monsters roaming everywhere. Link used the Four Sword to break the people's curse and fought bravely and long to get past Vaati's minions, but as he approached the roof, Vaati's voice taunted him saying that it was too late to stop the ceremony and that the next three chimes of the castle bell would take all life and light force out of Zelda's petrified body, making him as a god. 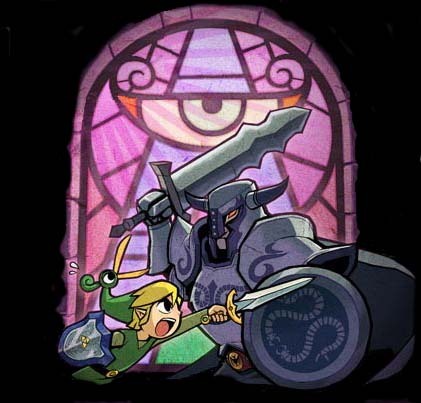 Link rushed onward fighting Vati's trusted guards yet managed to reach the fiend only after the bell rang twice. With malignant confidence, the sorcerer said what light force he had drained from Zelda was sufficient to make him unstoppable and, upon changing into a far more devious form, confronted the hero. At some point in the battle Vaati renounced to his human form and was changed into a large eye enshrouded in darkness. To defeat him, Link had to use the full power of the Four Sword, splitting himself to attack his foe and to Vaati's disbelief, Link prevailed. At last, Link could break the curse on Princess Zelda. The princess thanked him, saying she had visions of his struggles while she was turned to stone but immediately the castle begun to collapse. They tried to escape but finding the way obstructed by debris the only option was to take refuge in the Four Sword Sanctuary, however when they entered the castle courtyard Vaati's voice was heard, he spirited Link away and the fight begun anew. This time Vaati had grown arms and was even more powerful. It was by far Link's hardest battle and he had to use both Ezlo's shrinking spell and, when the arms were gone and Vaati sprouted wings, the Sacred Sword's power to repel dark magic back to the sorcerer defeating him. Vaati was gone, all that remained was the Minish Cap, the original source of his magic. Zelda thanked Link again for his efforts and prepared to mourn for those who suffered under Vaati's onslought. Just then the curse on Ezlo broke and he returned to be a Minish; he apologized for creating the artifact that brought so many disasters but added that it was too soon to despair. Zelda, he said, still possesed some of the light force, if her magic was combined with that of the hat everything could be restored to the way it was. All Zelda had to do was express her wishes and she did. The strain broke apart the Mage's Cap, but the castle returned to normal, the people were revived and the monsters that had been freed were gone, all in a flash of light. At that time the door to the Four Sword Sanctuary and the world of the Minish begun to close, forcing Ezlo and Link to say their goodbyes. 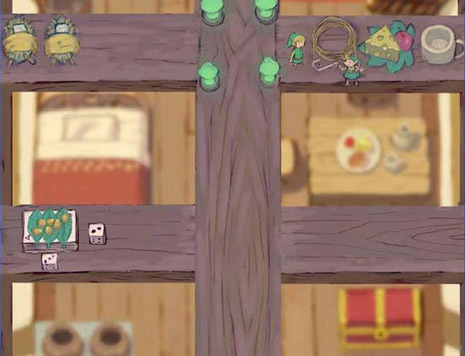 As a parting gift, The Minish gave Link a green hat in the same shape Ezlo had been cursed into except for the missing bird head.